What many of us forget, or begin to neglect when we become parents, however, is that care giving is something we need to do for ourselves as well. For some, the term self-care brings up ideas of indulgence, selfishness, or luxury. While it may sound pleasant to take care of yourself, many parents also feel guilt, anxiety, and even shame when they take time for themselves. For others, they might use humor to cover over sadness or frustration at the lack of time they take and even request for their own well-being. “Hardly any of my mom friends do fun stuff just for them. If we want to get together without kids, we have to plan at least a month in advance,” a mama once told me when we talked about her doing more self-care. The old way of thinking about parenting and family life didn’t recognize the importance of self-care. Sure parents still had children in day-care and hired sitters for occasional date nights, yet the underlying reasoning was less likely to be about self-care. I explain the necessity of self-care in my post, What difference does parental self-care make? For now, let’s clarify what I mean by self-care. For the parents I coach, I explain that self-care means doing things that nourish you by rejuvenating your body and replenishing your spirit. Self-care also has a sense of scale: there are basic actions of self-care and there are actions that may be more elaborate or optional. On the more optional side of the self-care scale may be activities like taking an art class, getting a regular manicure, or meditating each morning. While not as essential to our overall well-being as proper nutrition, exercise, and sleep, these choices also rejuvenate us and fill our personal fuel tanks. In the final post of this fundamentals of parental self-care series, I’ll share ideas for how to incorporate more self-care into your life. For now, let’s close with a couple of exercises. How well are you caring for yourself right now? Take time to answer the following questions to see how attentive you are to your own self-care. Which of these statements would be true for you? I do something just for myself every day. I am in good physical shape or am getting there. I feel really grateful for and satisfied with my life. I take good care of myself without being reminded to. I have enough energy and attention for myself and my family. Nothing regularly gets in my way of caring for myself. What are two to three things in the self-care realm that you’ve been putting off doing for awhile? Once you’ve gone through these statements and questions, determine what seems like an appropriate next step and take it. Is it time to get a new water bottle to carry with you? Would you like to head out for a walk or put one on your schedule each day? Does it make sense to move your children’s bedtime up a bit so you get to sleep earlier? Even if you come up with five new “ah ha”s or ten possible actions to take, commitment to simply taking one action today to better care for yourself. Your body and spirit will thank you. Make your self-care into a habit and your family will thank you too! I would be delighted if you would post a comment to inspire others. List one self-care activity you’re already doing or are starting today. If you’re still stumped, post a question and I’ll follow up. Self care has been my theme this week. It’s SO easy to fall off that wagon during the summer! Had tea on porch with a friend, made cushion for porch swing, acupuncture and massage. Feeling ridiculously lucky and so good that I’m ready to continue sharing my gift of love with the world! 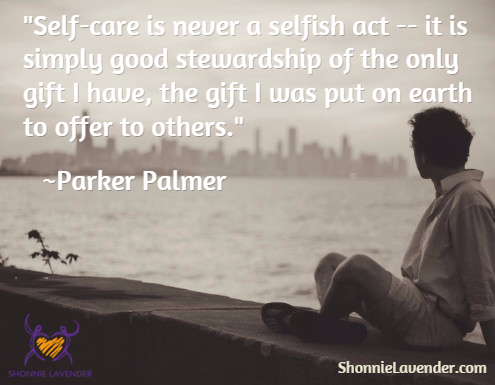 Self care is powerful stuff… Thanks Shonnie. Glad you’re back on the wagon, Cindy! 🙂 It is so easy for many of us to let our self-care slide, so thanks for sharing about your success and challenges.